In North America, billions of plastic bags are used once by consumers and then thrown away. To help reduce waste and keep the environment clean, Davis Orthodontics is providing patients with the new environmentally friendly Insulated Polyfabric Bag. These bags are made from 100% recycled materials and are designed to be re-usable. The bags are incredibly strong, maintain their shape and are insulated which allow you to carry your refrigerated or frozen groceries. 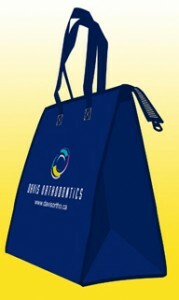 If you have not received your bag yet, drop by the office to pick one up, while quantities last.